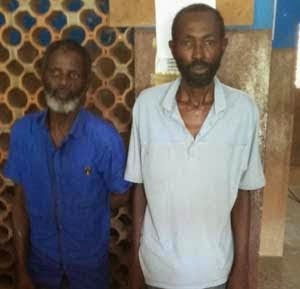 An armed robbery suspect, 45 year old Jide Abass (pictured right) who was arrested alongside his accomplice (Lukmon Bello) while they were attempting to rob outside a bank in Ogun state on Monday May 11th, said during his interrogation by the Ogun state police command, that the cashless policy introduced by the Central Bank of Nigeria has affected the operations of armed robbers in Nigeria. According to him, people do not move around with large sums of money anymore as they now go about paying for things with their debit cards. "We usually laid ambush for bank customers, especially those who had gone to withdraw money. It is not difficult to notice them. For the men, it is either their pockets would be bulging or they would come out with the usual black nylon. For customers who came in their vehicles, we would either ambush them or trail them to safer places where we would collect the withdrawn amount. But since the introduction of cashless policy, people don’t usually got out with cash. Even when they go to eateries or super markets, they make use of POS and this has been affecting our operations. We started operating in Ikorodu, Lagos State but since the police seem to have braced up to the challenge, we decided to relocate to Ogun State. This is our fourth operation here. I am ashamed of myself because my two wives may likely divorce me if they find out their husband is a robber,” he said. "I was initially into international trade. I usually travelled to Dubai to buy men’s clothes to sell until the trade crumbled. I had also travelled to Mecca, Saudi Arabia, twice, to perform Holy Pilgrimage.